A mother black bear and her three cubs unexpectedly appeared on a bridge in Yellowstone where sightseers had stopped to take pictures. Video from the bridge captured the incident, which went viral online. Spring is peak tourist time in Yellowstone National Park, but the warmer weather is also favored by black bears. Last week at Yellowstone, tourists and bears collided on a bridge, when a mother bear and her three cubs appeared as tourists had stopped to take advantage of the view. 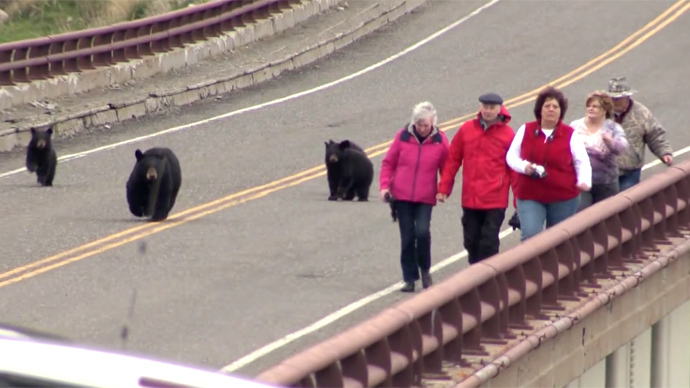 Video from the event opens by showing the trotting black bears following behind a group of five tourists who are walking swiftly away and towards the camera. “Keep going!” shouts a voice off-camera. Several tourists think they are far enough away to stop and take photographs, but at that moment the mother bear darts forward, leaving her three cubs some distance behind. Seeming terrified, the mother bear charges towards one family and is then out of the camera’s view. Moments later, she is back herding her cubs together. The tourists did make the right defensive moves, which are to quickly move away from the bears without engaging. Wildlife expert say that is keeping a distance is the best defense, and Yellowstone regulations tell visitors to stay at least 100 yards from the bears at all times. Park officials told ABC News that sightseers and the family of bears parted ways without any attacks or aggression, but they said the run-in is an example of the dangers in the national park, especially with 3.5 million visitors each year. “A mother bear with cubs is not something you want to try and get too near to at all,” Jack Hanna, director emeritus of the Columbus Zoo, told ABC News. In a related story, a family visiting Yellowstone Park last year had a less stressful encounter with a grizzly bear. From the safe confines of the car, a grizzly bear is seen, on video, stopping by a pole and suddenly rearing up on its hind legs to start scratching its back. Since it’s not against a tree, the whole scenario looks like a pole dance. The video capturing the incident also catches the children’s laughter and delight.